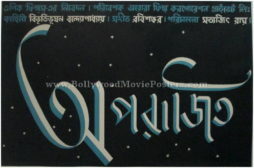 Extremely rare vintage Satyajit Ray movie poster of one of the finest films ever made in Bengali cinema, Aparajito (1956) for sale. Aparajito is an adaptation of Bibhutibhushan Bandyopadhyay’s novels Pather Panchali (1929) and Aparajito (1932). A sequel to the one of the greatest film’s ever made in world cinema, Pather Panchali (1955), Satyajit Ray’s decision to make Aparajito was largely due to the massive critical and commercial success of its predecessor. Aparajito won 11 international awards, including the Golden Lion and Critics Award at the Venice Film Festival – becoming the first ever film to win both accolades. The critical worldwide acclaim that Aparajito received encouraged Satyajit Ray to make another sequel, Apur Sansar (1959), which was equally well received and thus concluded one of the most critically acclaimed movie trilogies of all time in world cinema. Aparajito remains till date the only film sequel to ever win the grand prize at the Venice, Berlin and Cannes Film Festivals, making this rare Satyajit Ray movie poster highly collectible! Printed and circulated during the debut release of the film (somewhere in the mid 1950s), this is one of the rarest Satyajit Ray film posters for sale that one can buy. Aparajito features consistently in several polls of all-time greatest films. Most notably, in 2005 The Apu Trilogy was included in Time magazine’s All Time 100 Greatest Movies list. The stellar success of the film prompted the Academy Film Archive to preserve Aparajito in 1996.